Miami has approved a pilot program in which electric scooters have been placed throughout the city. The test will run for six month, with up to 300 scooters. Six companies are part of the pilot – Bird, Bolt, Jump (owned by Uber), Lime, Lyft and Spin. Each will be allowed up to 50 scooters. Pricing depends on the company, but starts around .15 cents per minte. 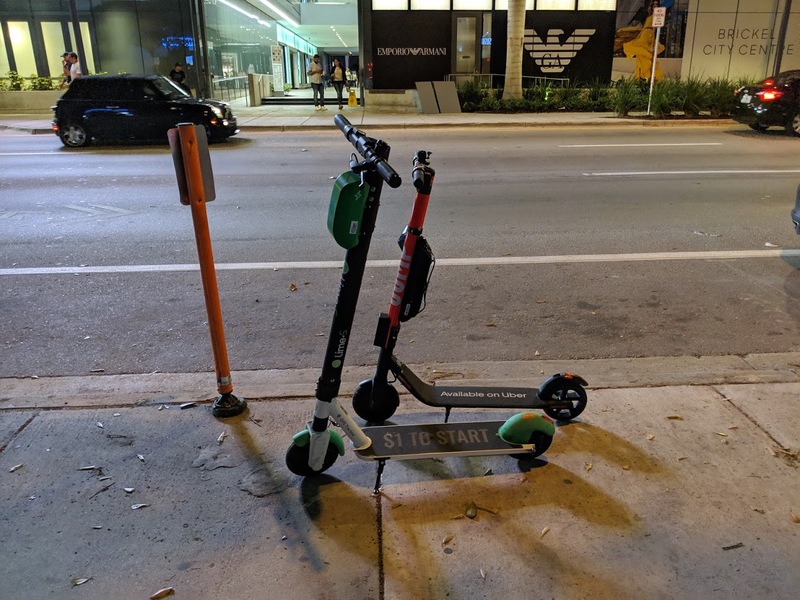 Scooters were previously placed in Wynwood, but weren’t legal and were ordered removed. Under the test approved by the city, the Miami Parking Authority will enforce docking rules that could lead to fines of up to $25 each time a sidewalk is blocked. Won’t lie, I’ve been having a lot of fun on these… can’t be the only one…. Rode one every day since they were released on the streets. With only 50 per vendor, I am constantly hopping between Apps to find a ride. yeah that is the annoying part and sometimes its a new company I don’t have the app for. I’m sure someone is coming out with a app that could access most of them. Mark my words, a few people will be killed or badly injured by the end of the year by riding these scooters. 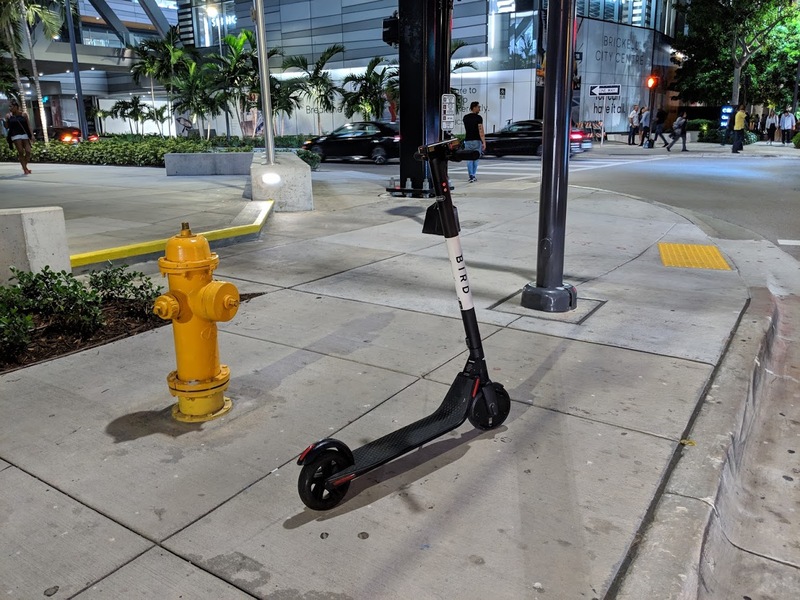 Miami has some of the worst drivers in America and mixing these scooters on top of them can only lead to one thing. Agreed, we should ban all the cars from downtown so this doesn’t happen. Stop being a jerk! That was not the point being made and you know it. I know of at least one rider that was killed on Alton and 16th street in January. I’d imagine the scooter companies are throwing money at the families to keep the stories as quiet as possible. Please don’t spread false information. While still a tragedy, she was on a larger Moped Scooter, not the smaller Electric Scooter that’s discussed in this post. Yep, they are fun. This is what we were “promised” back when Segway was first invented. Love them. Hopefully they are he to stay. Really make getting around the city easier. Hope the police enforce the riders to follow the basic rules, so the scooters don’t get banned again: don’t ride on sidewalks instead on the right side of the road going on cars direction, 1 pax per scooter, follow traffic laws. A few tickets here and there to the rider’s driver’s license will help things being under control. That’s the problem we have in Ft. Lauderdale, zero enforcement on law-breakers. The worst are parents who allow their young children to ride tandem with them, esp. without a helmet. Also check the specific rules–in FTL they’re banned from actual roads–Sidewalks & Bike Lanes only. Cool, how about some bike lanes? *we just want wider sidewalks. Shouldn’t they be on the street? There is no profit in bike lanes. And you somehow think there’s profit in roads? is there any truth that this is a Pilot Program, for which the City will eventually choose one vendor to proceed, a la Citibike? Sure hope they aren’t going that route, as the competition from multiple vendors helps keep prices in check. Who decides which Scooter vendor(s) get to stay? I like Lyft the best, probably for the same reasons you like Uber. i already use Lyft as my primary rideshare so I have the App, and it’s just easier to use a single app, single company. What a fun roll out weekend with Bad Boys 3 filming & lots of road closures. I hope they manage to work a scooter scene into the movie somehow. About time Miami catches up with Ft. Lauderdale! yeah I was at downtown ft lauderdale for art walk and noticed they had us bet with having these things everywhere. With the rest of the major metropolitan cities. Orlando already has a smart city and they were due to roll out the first autonomous cars (Beep) this year. I hope they make them PERMANENT! and hope they expand the area where they are allowed. usually the crooked politicians from Little Havana didn’t want them around. i guess they didn’t get a nice pay out. The sad state of the sidewalks really juxtaposes with the scooters. haha those get left everywhere. Do you expect differently?